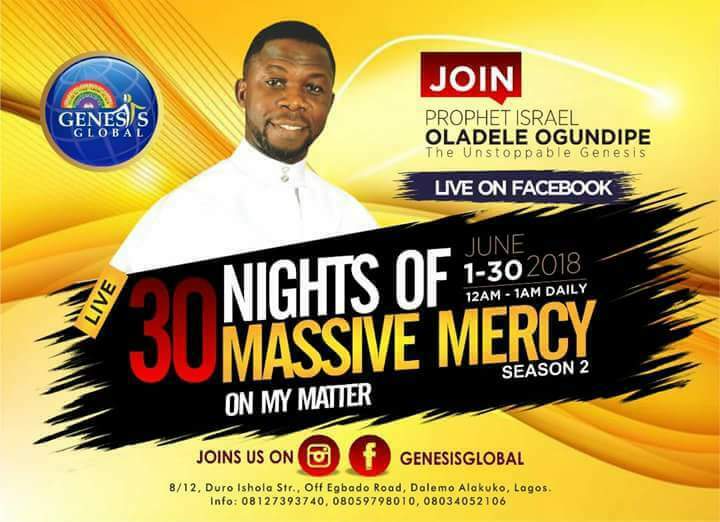 This program was first introduced to the social media in February 2018 by Lagos based Prophet and televangelist, Prophet Israel Oladele Ogundipe. The testimonies recorded as a result of that program was tremendous, but season 2 of the 30 nights of massive mercy has so far witnessed incredible Prophecies and testimonies. This program started on the 1st of June and will run through to the 30th of June. The presence of God that this online prayer meeting carries is beyond human comprehension, Prophecies given are instantly confirmed online by viewers watching. So far, it has been an interesting season of the Program. This season also witnessed an online next rated choir member musical competition that saw Ewaoluwa Afolakemi emerging as the winner of the 500dollars price. According to Prophet Israel Oladele Ogundipe, the last 7 nights will be purely Prophetic and the Miraculous will happen. You can be part of the remaining 7 nights of this Program between the hours of 12:00am to 2:00am.